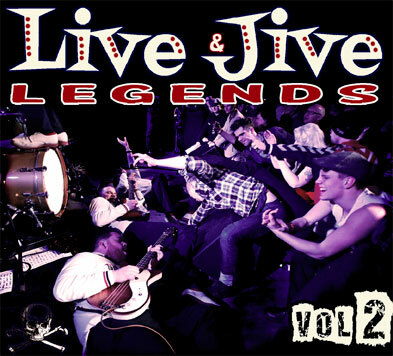 LIVE & JIVE LEGENDS 2 – A WILD ROCKABILLY COMPILATION – now out on HEPTOWN RECORDS! We noticed there was a big demand for a second volume of the Live & Jive Legends compilation, since the release of volume 1, about 5 years ago. So, we gathered about 20, out of the many great bands that have played L&J to participate on this record. We wanted to display the variety of styles that has made the Live & Jive international music festival famous. You will of course find amazing rockabilly bands such as The Go Getters and Eddie & The Flatheads on this compilation, but also one of the best surf bands on the scene, The Barbwires. There is plenty of action on this compilation, punkrock legends The Accidents, and the insane international collaboration The Dragtones, featuring members from The Hives, and Fatboy will make sure of that! Not to mention the previously unreleased track by psychobilly legends Batmobile.